One of our most popular shows returns with an all-new production. A Broadway smash hit with a politically incorrect title, this laugh-out-loud comedy pokes fun of everything in its path. In a dystopian, drought-filled future, a large corporation has a monopoly on all toilets and people must pay for the privilege to pee. Hero Bobby Strong steps in to fight for people’s right to pee in this hilarious send-up of corporate greed, ecological disaster, and musical comedy. So irreverent, so fresh, so original and so funny that – you gotta go! Directed by Donna Spencer with music and lyrics by Mark Hollmann and book and lyrics by Greg Kotis. Featuring David Adams, Michelle Bardach, Chris Cochrane, Andrew Cohen, Meghan Gardiner, Katey Hoffman, Patrick Keating, Chris Lam, Anton Lipovetsky, David Marr, Matt Palmer, Rosie Simon, Shane Snow, Tracey Power, Donna Spencer & Andrew Wheeler. Read the most recent show reviews. 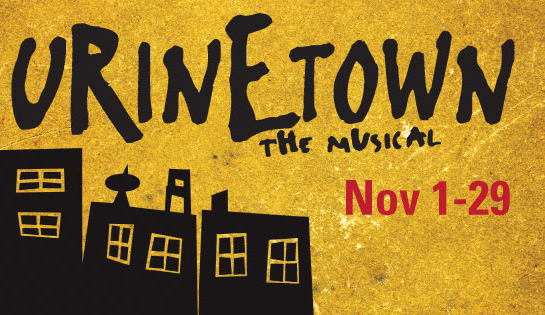 FREE Talkback about how the issues around environmental disaster, water and climate change in Urinetown relate to the situation in BC. Featuring Environment Critic Spencer Herbert and Climatologist Stewart Cohen. Stay after the 3pm matinee or come early for the 8pm show (panel will finish at 6:15pm, allowing enough time for dinner prior to the show).